This part of the #runstreak story began at the moment I crossed the 10K timing mat at the Boilermaker. It’s usually a great moment. Two-thirds of the race is over, the really hard parts of the course are done, and all that’s left is to negotiate the gradual incline to Utica College. Then it’s literally all downhill for the next two miles and the finish line. To mark the runners’ progress, the Utica Fire Department stations a ladder truck there every year. They drape a giant American flag from the top of the ladder, then cheer on the runners as they cross the split mat. So, it’s a good place to high-five some of Utica’s finest and take a quick breather before soaking in the cheers from the crowds that are waiting at the corner of Burrstone Road and Champlin Avenue and beginning the final push. At least, that’s how it had been for me every year since 2010. But this year turned out to be very different. And not in a good way. I can’t say that I was surprised. The warning signs were all there, though when they began I can’t fully pinpoint. After a week of recovery following Burlington, where I ran just 16 miles — my lowest weekly total of the year so far — I upped my weekly mileage to the low thirties for the month of June. I felt good — strong and fast — and I had no concerns until the week before the Boilermaker. That week, a pain started in my left side that would not go away. At various times, it felt like someone had welded a steel plate onto my glute. My hamstring was as tight as a drum. And the pain radiated down my IT band and into my calf like a lightning bolt. No matter how much I stretched and scaled back my mileage and speed, the pain remained. For the most part, I ran within blocks of the house, so when the pain got too intense, I could bail and head home with just the bare minimum mile under my belt to keep the #runstreak alive. It was so bad, I really should have stopped the #runstreak right there and then and pulled out of the race before starting. Except, I’ve never, ever done that with any race I’ve entered. And I especially wasn’t going to do it in a year when the Boilermaker race organizers published a revised version of my 15(K) Reasons to Love the Boilermaker in the race day program. So, there was ice. There was ibuprofen. And a lot of unanswered questions. Was this overuse and the #runstreak finally breaking my body down? Was it my new pair of Asics Gels forcing my body into a different, unfamiliar posture? Or was it the culmination of years and years of running without any real formal understanding of the body mechanics needed for a 58-year-old man to do this? The questions still swirled stubbornly unanswered on the morning of the Boilermaker, which meant that the ritual peanut-buttered bagel and Gatorade breakfast was augmented with 800 mg of ibuprofen and a heartfelt prayer. And for the first 10K, Golf Course hill and all, that seemed to be enough. But the minute I crossed the 10K mat, the pain shot through my hamstring like a murderer’s knife. For the first time in the nine years I had run the race, tears started to well up in my eyes. I moved to the side of the road and stopped running. My first thought was of my run at the 2014 Mountain Goat, and the severe calf strain that I suffered just after the first mile. The memories came flooding back — I finished that race, but within minutes of crossing the finish line, I could barely walk unassisted. I was laid up for over a week, just three weeks out from running my first Vermont City Marathon. With that in the back of my mind, I quickly reasoned that, with no upcoming races, I had plenty of time to recover. Plus, I was much further along in this race than I was when I got my injury in the Mountain Goat. Now, all that I had ahead of me was an easy 5K to the finish line. So, after what seemed like minutes but was really more like a few seconds, I gingerly put some weight on the leg and slowly started to walk, then jog, then run. The hamstring pain was still there, but it wasn’t so sharp as it had been. The pain in my left glute (insert punchline of choice …) was there, too, but it felt more like stiffness than a stab wound. By the time I got to the Burrstone-Champlin turn, I knew I could finish, time be damned (though I actually ended up running the last third of the race seconds faster than I had run either of my first two splits). I reached deep into that reservoir of mental toughness that had been building up in me since the beginning of the year thanks to the #runstreak and focused on getting the job done. 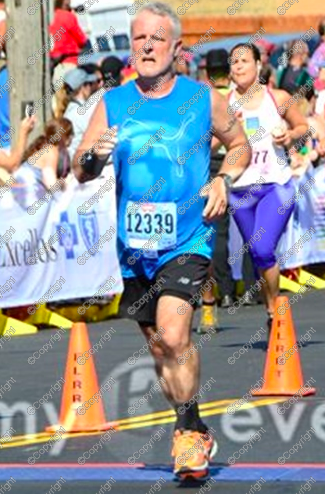 Aside from a quick high-five from the Stilt Man just before the eight mile marker, I was barely conscious of the crowds until I looked down from the brow of the short Court Street downhill toward the Varick Street finish line. and time for my ninth two-fisted toast to my favorite race. Only this time, the beer tasted that much colder and sweeter because I had cheated injury and survived to run another day. Later that Sunday when I got home, I looked over the stats for the day and noticed that around the same time I felt the hamstring pull, I had passed 1,000 miles of running for the year. 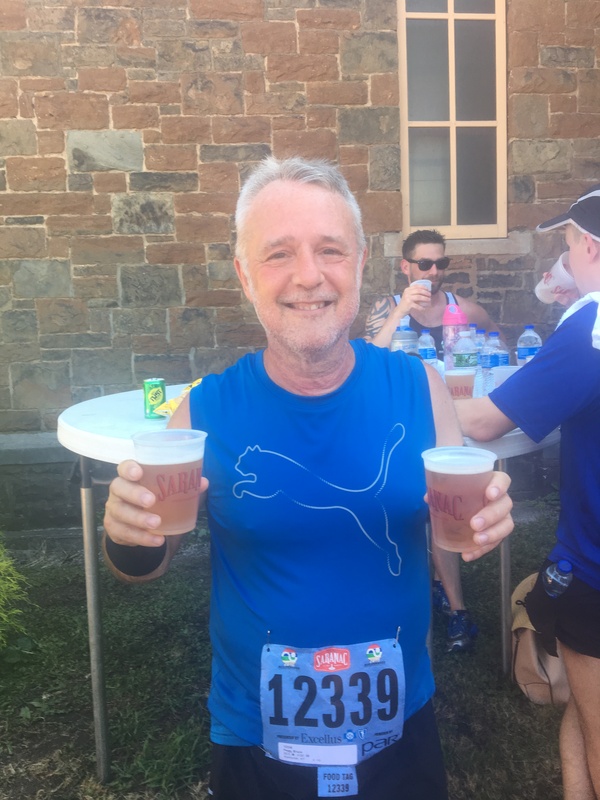 More, even though I had failed to break the 80-minute barrier for a second successive year, I had still clocked my third-fastest Boilermaker ever. For all its pain, the 2018 Boilermaker was going to go down as one more memorable chapter in my ever-lengthening Boilermaker story. But what I was going to face on Monday was anyone’s guess. This entry was posted in #runstreak, The Flat-Footed Fox and tagged #runstreak, Boilermaker, fitness, long-distance running, running, running injury. Bookmark the permalink.